Rectory Cottage was at the junction of Hall Road and Cherry Orchard Lane, before the new road was built. The gentleman who lived there once told me that on a holiday in Italy he was so impressed with the pillars and statues that he decided to make some for his garden. Then friends asked him to make one for them and gradually he built up a business making statues, bird baths, plaques, in fact anything you wanted he would make it. 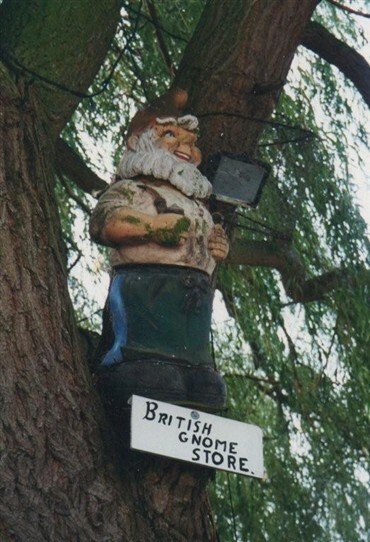 The garden a was full of all kinds of stone objects; high in a tree just by the gate was a big gnome with a sign saying British Gnome Stores, and another one saying ‘Why are you looking up here’ . There was also a big frog post box. I noticed the last time I passed the cottage that the garden is still full, but the signs are no longer there. This page was added by Mave Sipple on 12/11/2012.